Lately my son (currently 16 months old) has been enjoying spending time with me in the workshop (he says workbop). He likes to hammer on stuff and is really enjoying using a toy saw and a toy plane to imitate his dad. The problem is, my bench is too high and the 5 gallon buckets I turn over for him to work on are too ..errr… unbench-like (even though they have served as my “saw benches” for years). He needs a bench of his own that is the right height for him to use for a few years. It kills me to make something he’ll only use for a little while, so I wanted it to be utilitarian too. A pair of Saw Benches seemed the perfect fit. He could use them as his work bench and I could use them for hand-sawing. First the research. I looked at saw benches done by Chris Schwarz at Popular Woodworking. It was nice, but, in his design the legs are always splayed out and I knew that would inevitably cause several falls for my son as he tripped over the legs. Plus it didn’t look very workbench-like from the point of view of a little guy wanting to work at his bench just like daddy. I was also concerned that the splayed legs, while not a problem for crosscuts, might get in the way for rip cuts. So I kept digging. 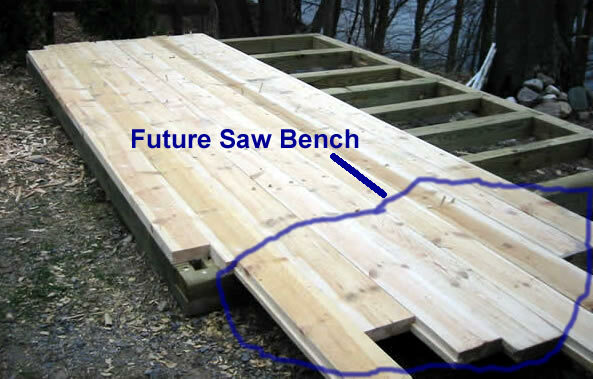 I ran across a straight legged design on The Village Carpenter …which then traced its roots back to Dan’s Woodshop and it was enough confirmation for me that a straight legged saw bench could be just as functional as a saw bench and had the added property of being able to look like a real workbench to a wee child. Of course I had to make some modifications just to …errr …. make it more “mine.” I added a pair of saddle notches on the uprights so that a 3/4″ pipe clamp could be placed in it and used as a crude bench vice (a la New Fangled Bench … hmm New Fangled SawBench). And of course any use with a bench vice would need bench dogs, so I added 2 strips of 3/4″ holes for bench dogs. Given the 2″ thick top, the holes could also accommodate a holdfast or Wonder Dog. The simple shaker style bench rails were crying out to me to have a dovetail added just for fun, I’m sure they weren’t really needed. Originally this was going to be a quick project from a couple of pine 2″x8″ s. Then I got to thinking about a stack of rough sawn 2×8 cutoffs that came from the flooring of my timber frame gazebo. Sure they were rabbeted on each side, but I could cut that off and they’d only be down to 2″x7″. Oyyy why do I choose to make things difficult? Those red pine cut-offs are now several years old, weathered, twisted, knot laden, and blue stained. And then there is me with no thickness planer or power jointer. Out comes the #5 Jack plane that is set up more like a scrub plane. Flattening each face was not unpleasant… I had a lot of fun with it, but with all those knots, keeping each face parallel to the other was just not going to happen. And so it didn’t. This of course complicates layout a little bit, but dealing with not fully squared lumber is something I’ve gotten pretty accustomed too thanks to the timber framing project. Here’s the Sketch-up plans and with a little luck my next post should have the finished results … or the photo of a nice bonfire. Apologies to anyone using this model for the 2×7 lumber in the design. It should be pretty easy to adapt the design for standard 2×8.